I own two Instant Pot (Instant pot Duo 7 -in-1 6 quart). Ever since I bought them, life is good:) I have reduced stove top cooking alot. I have already share the Dal makhani recipe prepared using Instant pot. In the months to come, I will share more recipes using the INSTANT POT. In this recipe, I have used my own simple spice mix rather than the store bought garam masala. I have used fresh vegetables but you can use frozen vegetables instead. 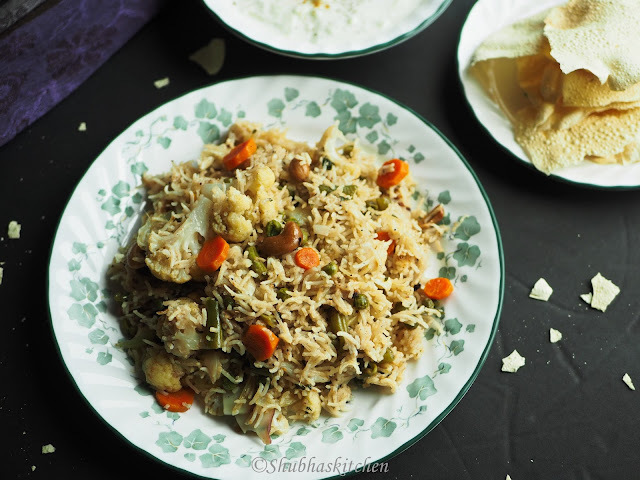 The spice level of this rice can be adjusted as per ones own taste. It serving with a spicy curry, make it mild. If serving just with raita, then you can increase the spice level.The measurement of water mentioned is specifically for the instant pot. 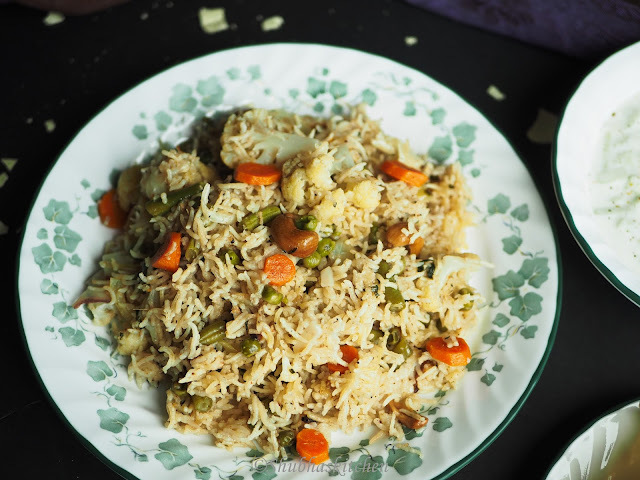 If you want to try this recipe using a stove top method then the rice to water ratio will be 1:2. Also, I have used the regular measuring cup and not the one provided with instant pot. Keep this in mind if you were to double this recipe. Using a dry grinder or coffee grinder, prepare a spice mix powder out of the ingredients mentioned in the "spice mix " section. Set it aside. Start the Instant Pot in the "saute" mode. Add oil. When the display shows HOT, add the prepared spice mix, bay leaf and the cashews. Add the onion, ginger and garlic. Saute until the onion starts changing color. Add the chopped cilantro / coriander leaves. Add the vegetables and mix. Add the red chilli powder / paprika. Press CANCEL button and close the lid with the valve in the sealing position. Press RICE button. Once done , turn off the instant pot . Once the pressure has released (the silver button near the sealing valve goes down), fluff the rice gently with fork. 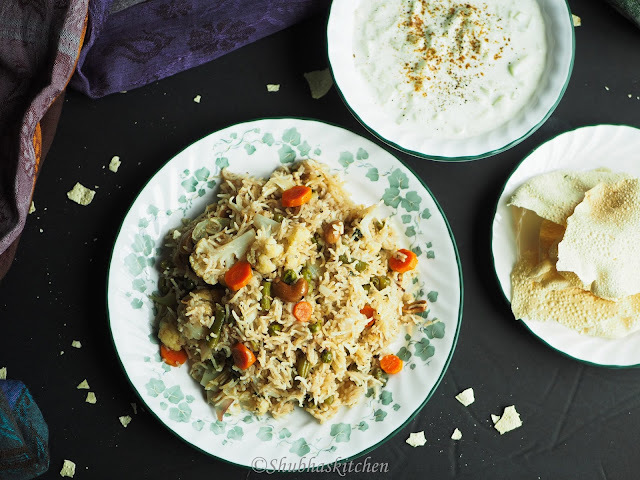 Serve delicious Vegetable Pulao with the curry or raita of your choice. Excellent looking Pulav . Well written recipe with crystal clear step by step pics and sharp images.